It started in June of 1949 as a one-day festival featuring a German band, a dairy speech, a baseball game between Roscoe and Lake Henry, a drum and bugle corp, a celebrity radio broadcast from Paynesville, and lots and lots of free ice cream. This year, to mark the 50th anniversary of a Paynesville festival, called Town and Country Days since 1961, the festivities will last a full week, starting on Saturday, June 12, and climaxing with the grand parade next Wednesday night, June 16. But Roscoe and Lake Henry could meet again on Saturday, June 26, in the final rounds of the baseball tournament that will bring this year's celebration to a close. 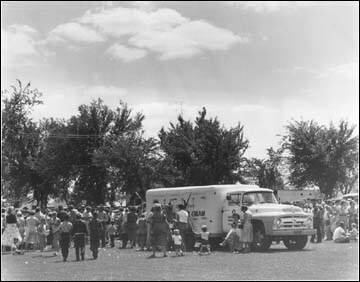 The original festival in 1949 was organized by the Paynesville Civic and Commerce Association to express gratitude towards local consumers and was held on the school athletic fields (now the elementary school) and across the street at the Village Park (now the Gazebo Park). The tradition of free ice cream began because at that time the North American Creamery was the major industry in town, manufacturing ice cream under the "Arvilla" label. Dixie cups were the style back then, later replaced by ice cream on a stick. Free ice cream was traditionally distributed by the members of the fire department. Free ice cream ended in 1982 in favor of reduced prices on malt cups, but, to commemorate the 50th anniversary this year, the fire fighters will once again give away free ice cream on Tuesday night. AMPI is sponsoring the ice cream this year. Two other traditional concession stands are still going strong after many years: the Lion's Club hamburger stand and the Rebekahs and Odd Fellows Lodge's pie and ice cream stand. Over the years, several traditions for the festival have been established. For instance, the Miss Paynesville Pageant is now held on the first night, to kick off the heart of the festival. For many years, the pageant has been held on Monday nights to lead up to the big parade on Wednesday, but the pageant was also held at other times in the past. The festival spanned the weekend for many years. 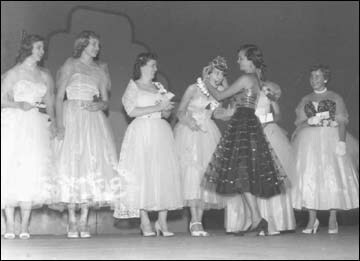 In 1949, Evelyn Wahl was crowned as the Paynesville Ice Cream Queen. There has been a queen every year since then. The Kiddie Parade is at least a 40-year tradition of the festival, and it is now joined by the Pet Show on Tuesday. The flea market is a revival of a former Tuesday tradition. The carnival is also a long-time staple of the celebration. For years, a circus was also held. 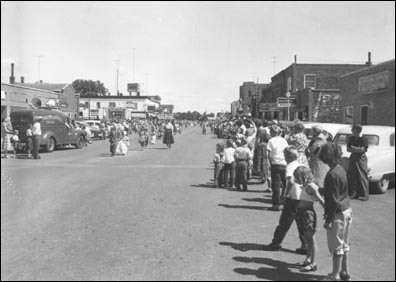 The carnival has been held in a number of venues over the years, from the elementary school grounds to the lots just north of the railroad tracks to downtown Paynesville. The grand parade is now held on Wednesday evenings, and it traditionally ends the heart of the festival, with the carnival leaving town the next morning. It hasn't always been at night; in 1959, the parade started at 1:30 p.m. in the afternoon. A whole host of activities has graced the festival over the years, including horse shows, golf tournaments, bike and trike races, tennis tournaments, stage coach rides, radio-operated plane demonstrations, calf roping, hat contests, tug-of-wars, hot air balloon rides, button contests, music shows, beard contests, and dances. The festival changed names in 1961. With the end of ice cream manufacturing in Paynesville, a contest was held to choose a new name for the festival. Eileen Flanders came up with the winning entry, and the celebration has been called Town and Country Days ever since.